I’m still working on thankfulness for the month of November. Are you? Day 3: Thankful for the naps Caitlin took, the chores I accomplished this morning during nap time, and the fact that the bathrooms are clean! Thankful for red nail polish. Day 4: Thankful that today is just one day and that tomorrow is another one. Thankful for the leaves crunching underfoot during my evening walk. 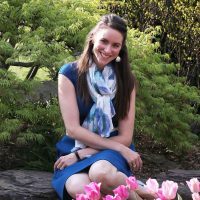 Day 5: Thankful for Sarah of Well Dined, who graciously came over and did the lion’s share of work to make this delicious lunch whilst my preschooler threw temper tantrums about the potty. Day 6: Thankful that my husband did the dishes this morning. Thankful that the sun is shining brightly. Thankful for praise music playing in the background, reminding me of God’s grace even in tough seasons of life. As I mentioned earlier, Sarah really did the hard work of prepping this dish (though she claims that my small contribution of peeling and slicing the sweet potato was the one step she really didn’t want to do….she is really too kind!). I just showed up to eat and eat and eat and eat. Pre-gaming Thanksgiving by a few weeks. Start with all the chopping. We are working with a humongous amount of chard here. Trim the ends from the stems, then cut the stems off where they meet the leaves. Line those stems up and chop them like they are celery, about ½″ thick. Toss the stems into a pot with chopped onion, butter, and some fresh grated nutmeg. Season with salt and pepper and cook until the stems are tender but not browned. We want beautiful colors! 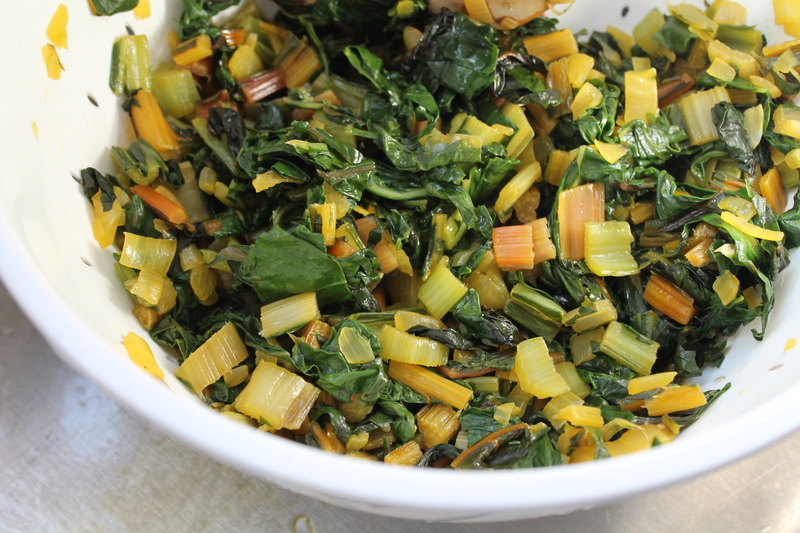 While the chard stems cook, roughly chop up the leaves. 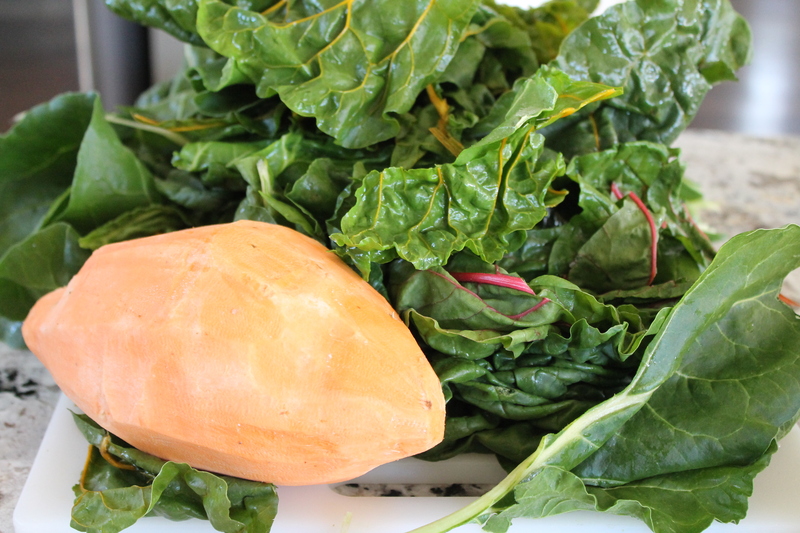 Also while the chard stems cook, peel and thinly slice a large sweet potato. 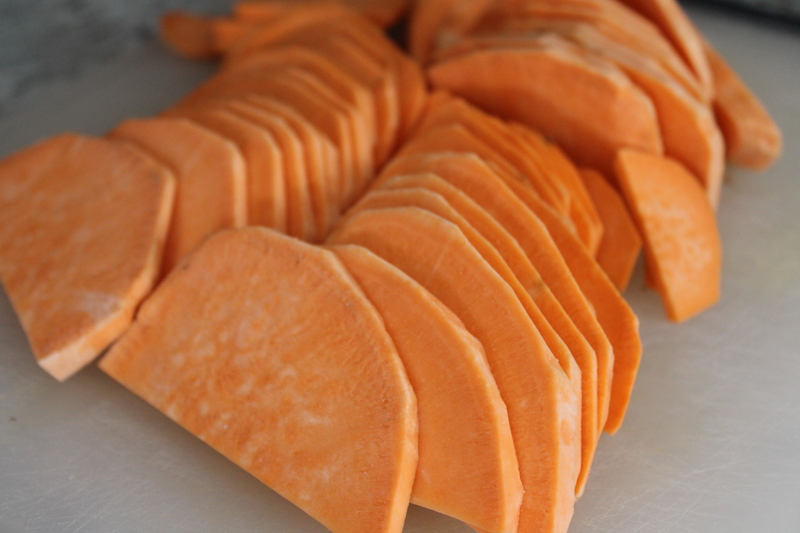 We are going to use these sweet potato slices (ours were half-moons, but if you are working with skinny potatoes then yours can be rounds!) almost like you would use lasagna noodles, to create delicious layers for our casserole. Make sure to slice them evenly, about ⅛″ thick, because they will be going into the casserole raw; any thicker and they won’t cook through properly. We also need to grate the Gruyère, de-stem some thyme, and mince some sage leaves. When the chard stems are tender, knock the heat up a few notches and begin adding in the leaves by large handfuls, stirring them into the stems and letting them wilt, until all of the leaves are wilted but not browned or blackened. Remove from the heat and dump the greens into a colander to drain. Squeeze out the excess liquid as much as possible. Now let’s make a béchamel right quick. In a small pot, combine cream (okay…you could use whole milk here, but why? With all these veggies, let’s indulge in some creaminess) and garlic in the pot and bring up to a simmer. In that same big pot we used for the greens, melt butter with flour over medium-low heat, whisking constantly to form a thick paste. Slowly whisk in the warm, garlicky cream, a few drops at a time initially so that the roux absorbs the liquid, and then faster as the texture evens out. Boil for 1 minute, or until thick. Assembly time. This is a process, much like making lasagna. It will be easiest if you divide the herbs into four small piles, and grab a quarter-cup scoop for the cheese. Layer half of the sweet potato slices in the bottom of a 9″x13″ casserole dish, followed by salt, pepper, a quarter of the herbs (one of those little mounds), and a quarter-cup of the cheese. Next comes half of the drained chard! 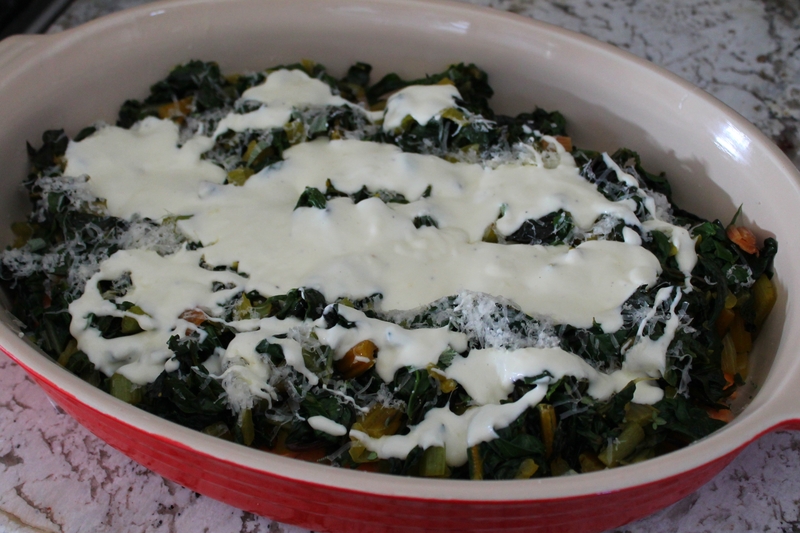 It’s not too easy to spread clumps of chard in an even layer, but just do it. Repeat the seasonings, fresh herbs, and cheese. Now half of the white sauce! Our white sauce was pretty darn thick, especially after standing for a few minutes while we snipped herbs from the garden and did the assembly prep. Drizzle it or spoon it as evenly as possible over the cheese; in the oven, it will sink into all the veggie crevices and become amazingly delicious everywhere. Nom. 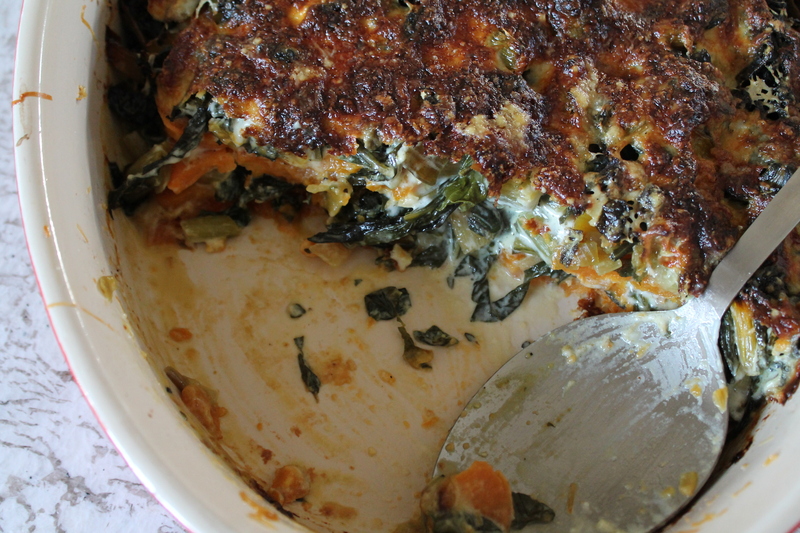 Then repeat the layers: sweet potatoes, seasonings+herbs+cheese, chard, seasonings+herbs+cheese, béchamel. Top off with a hefty final dose of Gruyère. Now bake it for an hour. Here’s a step we didn’t do: Check the casserole about halfway. If the top is getting already looking nice and brown, then tent the casserole with foil to prevent over-browning! But don’t worry…an overly browned cheese layer on top is still delicious! Melt 2 tbsp. butter in a large, heavy-bottomed pot over medium-low heat. Add the chopped onion and cook until softened, about 3 minutes. Add chard stems, pinch of nutmeg, and a light seasoning of salt and pepper. Cook, stirring regularly, until vegetables are tender but not browned, about 8 minutes. 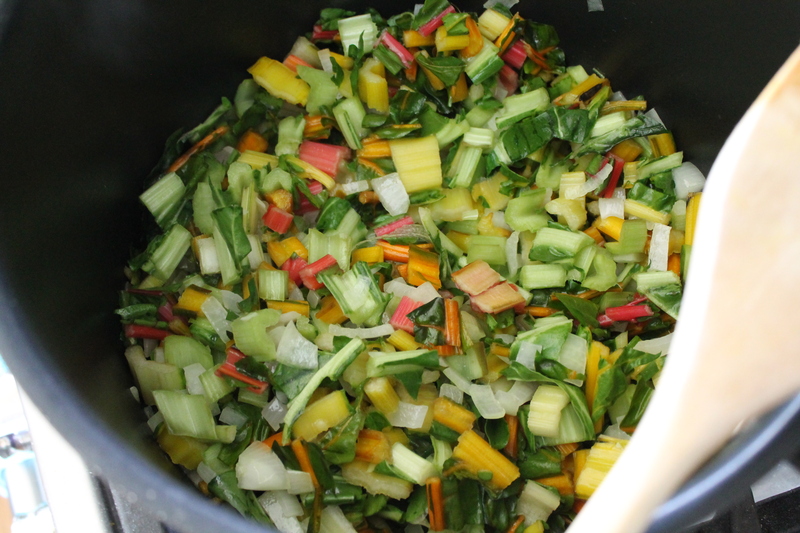 Increase heat to medium-high and add chard leaves by large handfuls, stirring, until all greens are wilted. Season again with salt and pepper. Transfer greens to a colander to drain, pressing out the excess liquid with the back of a large spoon. Set aside. In a small saucepan, combine cream and garlic and bring to a simmer. Meanwhile, in a separate medium or large pot, melt the remaining 2 tbsp. butter. Whisk in the flour and cook for 1 minute, until a thick paste forms and the flour is no longer raw. Slowly whisk in warm cream. Bring to a boil and boil for 1 minute, until thick. Season to taste with salt and pepper. Assemble the casserole in a buttered, deep 9″x13″ baking dish. 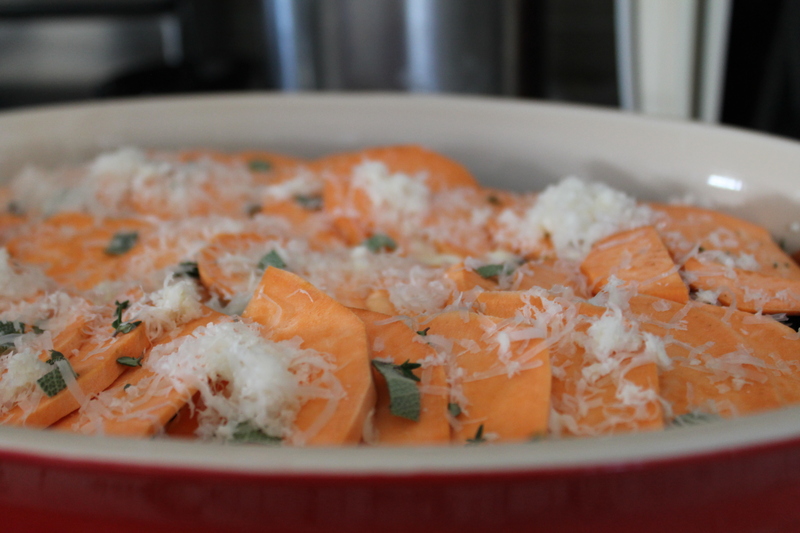 Layer half of sweet potato slices in the baking dish, followed by salt, pepper, a quarter of the herbs, and a ¼ cup Gruyère. Distribute half of the greens mixture over the cheese, then follow with salt, pepper, a quarter of the herbs, and a ¼ cup Gruyère. Pour half of béchamel sauce over the first two layers. 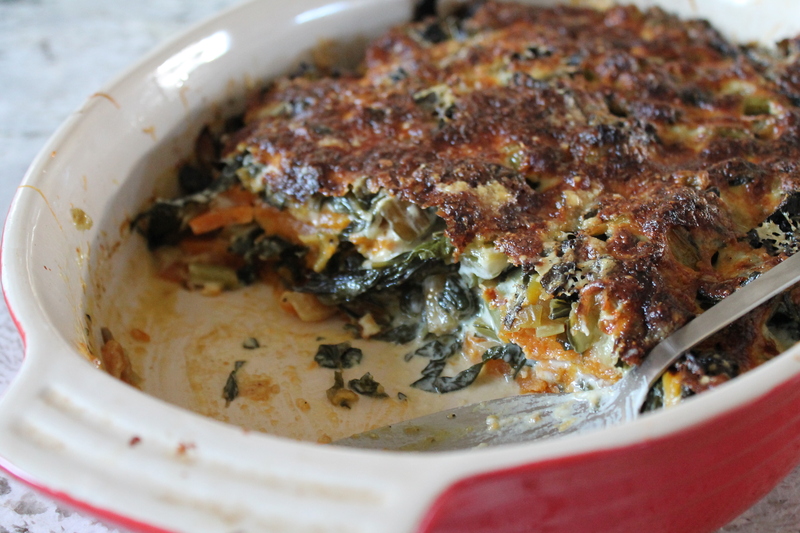 Repeat the layers: sweet potatoes, seasonings+herbs+cheese, greens, seasonings+herbs+cheese, béchamel. 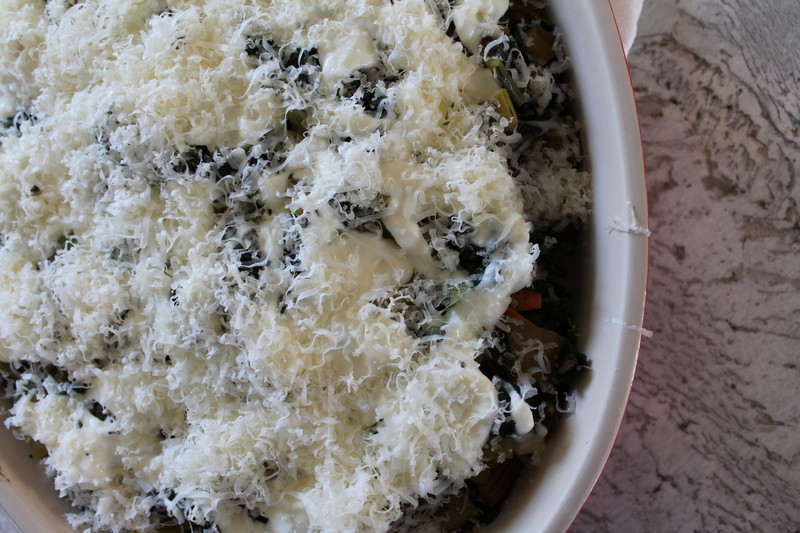 Top the casserole with the last ¼ of cheese (along with any extra, if there is any). Bake for 1 hour, until the sweet potatoes and tender and the casserole is bubbly. Check halfway and tent the casserole if the top is already browned. *Note: You can assemble the gratin a day ahead if desired, and bake the day you intend to serve.